We are writing here today to tell Everybody that our Earth is coming to an end, and with it, life on Planet Earth. What will cause this end to life, people may be wondering. Pollution. Pollution is the process of making land, water, air or other parts of the environment dirty and not safe or suitable to use. We caused this issue and we are also trying to solve it, which is why we’re writing this. According to Air & Water, if we don’t take care of ourselves, pollution, one of the most serious problems that should be taken care of, will cause effects on humans. Air & Water states that “air pollution can cause long-term and short-term health effects… Air pollution causes damage to crops, animals, forests, and bodies of water…A list of the human causes of air pollution includes vehicles, domestic smoke and heating, aircraft pollution, outdoor fires, and incineration of waste” (Air & Water). If just one of the seven pollutions causes this much problem for humans and the environment, just imagine what the other six pollutants can do. What we need is for everybody to know the effects of our own actions to the place we take advantage of. This will then make people aware of what they’ve done and do whatever it takes to reverse the effects. Not only does pollution affect humans, but it also affects the Planet Earth. According to Conserve Energy Future, pollution is everywhere and causes problems for humans and the environment. They say, “Every other day new industries are being set up, new vehicles come on roads and trees are cut to make way for new homes. All of them, in a direct or indirect way, lead to increase in CO2 in the environment. The increase in CO2 leads to melting of polar ice caps which increases the sea level and pose danger for the people living near coastal areas” (Conserve Energy Future). Pollution causes global warming, and that’s bad for the environment because ice caps are melting, sea levels are rising, penguins are dying and precipitation has increased around the world. This is why people need to be more aware of the things they don’t know because although they might not feel affected, that doesn’t mean that some other species won’t be affected as well. To conclude, what we need is for everybody to know the effects of our own actions to the place we take advantage of. This will then make people aware of what they’ve been doing for several years and do whatever it takes to reverse the effects. The issue is too much pollution, soon there will be enough to make this planet uninhabitable. This source says, “Our planet is running out of room and resources. Modern man has plundered so much, a damning report claims this week, that outer space will have to be colonized”(Earth ‘will expire by 2050’). This talks about how our planet is running out of room and resources, that’s also happening because we are burning and consuming all our resources. People will stay burning fossil fuels and be polluting our planet. But when we run out of resources to burn and waste here we will move on and colonize another planet and repeat the same process. We need to learn how to not kill everything in our path. This article says, “reveals that more than a third of the natural world has been destroyed by humans over the past three decades”(Earth ‘will expire by 2050’). This issue was caused by us using chemicals and gases that harm this planet but that also help us move around this planet. We do so many things in our daily life that harm this planet and that it slowly kills it. This planet suffers because of our actions, “Most of this air pollution we cause results from the burning of fossil fuels, such as coal, oil, natural gas, and gasoline to produce electricity and power our vehicles”(Cleaner+Greener). This matters because some people don’t even know we are harming our planet like this, we cause air pollution directly through our use of electricity, fuels, and transportation. We use all these fuels to get around and to fuel are cars and houses. We keep hurting this planet and we see the consequences but we just keep doing it. There have been more natural disasters and it’s being caused because of all the Co2 we are releasing into our atmosphere. Everybody is harmed because we all can’t survive in a polluted planet, people burn fossil fuels to create gas and everybody is harmed by it. Fossil fuels burns and makes gas, but then all of that is released into the air and everyone breathes oxygen. In an article, there’s evidence that says, “Long-term health effects can include chronic respiratory disease, lung cancer, heart disease, and even damage to the brain, nerves, liver, or kidneys”(eschooltoday). This proves that human civilization is being affected by pollution, it’s harming the way the human body functions. People think that pollution is not a big deal they take it as a low-risk thing. But pollution is affecting our environmental status, it’s killing our plants and things we need to be able to survive. These gases basically make the human body weak. The human body was once weak and throughout the time it became a stronger body but it can easily go back to weak. It affects most of our vital organs, this is because of smog. The effects are the same, pollution doesn’t choose to affect the poor or the rich it’s just everywhere, so big and small communities are affected. Just that the poor live closer to where the pollution is being released so they are affected a little bit more, but in time everyone is affected. The rich, they just have an advantage because they pollution is released around where the poor community is located. The business are not around where the wealthy people live, so they are still affected but not as much as the poor people are. This is not a matter of rich and poor people it’s about just stopping pollution because pollution will affect everyone. Our allies are those who want to protect the Earth from pollution or just from harming Earth in general. Everyone is our allies because I don’t think anyone just wants to die or have a polluted planet to live in. For people, it’s already a struggle to live because of pollution. Onitsha is a city located inside Nigeria a country in the African continent. This city holds the record for the most polluted city in the world, what’s happening in this city is soon going to be happening all over the world. People can’t live on a polluted planet, it’s just not sanitary. Humans can’t be breathing all this polluted air, what people are doing is just killing our future. People that are our allies they are making a small change but that’s where things start, but the people that should support all this is the Government and other countries. Our opponents are companies that cause pollution and those who do not believe in pollution, but we will want to convince them to care for the Earth because future generations might need to move to a different planet to live. People have raised awareness by protesting for a better and cleaner Earth, using clean energy, not using plastic, and not burning any kind of chemicals that harm our planet. They haven’t been successful because not many people are doing what they’re doing. And pollution is still a problem, just look at oil companies, ice caps melting, and the dirty beaches, they ’re not going anywhere until the issue is brought up by the whole world to make a change. But, with all the obstacles facing us, we are stepping in the right direction, because we can all raise awareness for Earth and cause more people to change their bad habits. We can all instead use clean energy. It’s not too late to save our planet. Look, we can’t force a change on anybody, as a matter of fact, we can only give information out to the people so that we can raise awareness for the ongoing issue. We will start small, like this, posting evidence and showing facts that haven’t even scratched the surface of pollution, to change people’s minds. Then, when everyone takes this situation seriously, every country, state, and city, will all come together to form an alliance to stop pollution. We will clean the streets from trash, find alternative natural fuels, clean the ocean, and many more actions toward success. We can’t do this alone, we need everyone to cooperate if we want our future to live on a planet worth living on. This plan is the plan towards change because when we all come together, we can make bigger impacts that will result in the irrelevance of pollution. eSchooltoday. Effects of Air Pollution on Humans, Plants, and Animals, eschooltoday.com/pollution/air-pollution/effects-of-air-pollution.html. This source is credible because they teach people about pollution, the effects of it. It gives people an image of how it will affect our body and our environmental surroundings. It also talks about how we can prevent this and if it’s already happening it shows solutions. This is from a reliable source from the guardian, this source shows whats happening on earth. It shows facts about how much time the planet has till it can’t support life for human beings. They also mention evidence and it’s all backed up. “Air Pollution.” Emissions Services by Cleaner and Greener®, www.cleanerandgreener.org/resources/air-pollution.html. This is a credible source because it shows scientific evidence and it also uses charts and graphs. Its backed up by T-tables to summarize effects of pollution on this planet. It is supported by evidence about how it affects our environmental surroundings, health effects, and economic effects. “Air Pollution: Understanding the Problem and Ways to Help Solve It.” Air & Water, www.air-n-water.com/air-pollution.htm. Air & water is a cite where it explains and gives facts about why people should think about saving our planet. They promote themselves by selling products that help and are safer for our planet. “Pollution: Causes and Effects.” Conserve Energy Future, 25 Dec. 2016, www.conserve-energy-future.com/pollutiontypes.php. This source tells people that conserving energy is the best solution to conserving a better future. If we conserve a better future for our present our future will be thankful for making it a better place. Solution for Pollution by Jose is licensed under a Creative Commons Attribution-ShareAlike 4.0 International License. Stop the gun violence in schoolsSay No to LGBT Discrimination! Hello Jose, I liked how you explained all the bad consequences that come with pollution and briefly break down all the little things that happen to us humans, the environment and the other living organisms. But my question is that do you think in your own opinion as of how pollution is right now do you think it will get worse or if it is going to become more sanitary for us? My name is Flavio Ayon and i’m a student at Unity High in Oakland. I just finished reading your blog post and all I pretty much would like to say is that I agree with all your information including the solutions to the environment and how to improve it. The only question I have is, is there a type of program that brings people to help with global pollution that everyone has access to? My name is Terrill Lenoir and I am a student at Fremont High School here in Oakland. I just read your project blog post and I have some feedback. One thing I liked about what you wrote was when they said ” the earth plant earth is coming to a end soon and how its going to in is going to be caused by pollution. Its very thoughtful but not persuasive to be i don’t believe it. I have to disagree with you bceause you need to have some evidence about you not believing in pollution. If your going disagree with us, support it with facts. 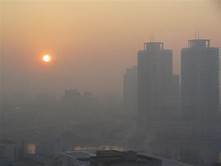 Pollution is harming our planet, have you seen cities in China and a lot of middle eastern countries, pollution is making their everyday worst. People in China have to wear masks to not be inhailing the toxic gases in the air. I would like for you to reply to this and support you’re belief with some evidence. Thanks for the feedback though. My name is Angel Rodriguez and I am a student at Fremont High School here in Oakland. I just read your project blog post and I have some feedback. One thing I liked about what you wrote was how you are really trying to stop this not by writting an artical but by making people more awake of what they have been doing. Something I have a question about is how can more people be more awake of this? One way that more people can be awake of this situation is by gaining knowledge and information about pollution and the different types of pollution. Than, they will be able to learn about how to make small choices that will stop people from causing more pollution. Hi Jose, I greatly enjoyed reading your blog. I think it opens in a powerful way. The title is catchy and the first paragraph or two do a great job of building interest in this topic because you make it clear that pollution is really hurting us. One thing I wonder about is whether there are any ways that activists have found to get more people to care about this issue. My sense is that some people know how bad pollution is, but choose to ignore it. Are there any ways to convince these individuals? Good luck with your project! I completely agree that this is a very important issues. Im glad that some people agree with me and my partner, we have put solutions so that people get to think of what to act on. People get to choose what they are going to do, We are trying to wake them up with facts. We don’t want people to ignore this, people should actually care about the planet they are living in. Thanks for you’re feedback Joe.